Results of AP Corporate Colleges Free Inter Admissions Notification 2018 For AP SSC Students, Online Application Form, Last Date, Selection Students List at apepass.cgg.gov.in. AP Corporate College inter Admissions Online Apply at apepass.cgg.gov.in last date 28-05-2018. Corporate colleges located in AP state in 13 Districts like Chaitanya, Narayana Colleges etc. Free Inter Admissions into AP Corporate Colleges 2018 AP Corporate College inter Admissions Free Inter Online Application Form, Free Junior Inter 1st year admissions in AP Corporate Colleges 2018 Details, Andhra Pradesh Inter 1st year Free admissions in AP Corporate Colleges 2017 under Corporate Education Scheme Notification, Selection list released. Intermediate 1st Year Admissions into Corporate Colleges In A.P for 2018-2019 @ https://epass.apcfss.in/CorporateApplicationForm.do, Free Intermediate in Corporate Colleges for BC/SC/ST/Min 10th Class Students District wise Selection list. AP Govt. is offering applications for Free 2 Years Intermediate Education with Eamcet Coaching in Various Corporate Colleges like Narayana, Sri Chaitanya etc., in Andhra Pradesh and Telangana States for BC/ SC/ ST/ Minority SSC Merit Students who have secured more than 7.0 GPA for 2017-18. The Students have to apply through epass.cgg.gov.in Website for obtaining or reserving their seat in the Corporate College. AP Government has given the Corporate Colleges Free Inter Admission notification 2017 schedule and online application forms are invited from the SC, ST, BC, EBC, disabled and Minority Students 7.0 GPA SSC 2018 Passed Candidates for admission into Inter 1st year courses in AP Corporate Colleges for the academic year 2018-2019. Interested AP students can apply from 04-05-2018 to 28-05-2018 through online mode at https://apepass.cgg.gov.in/ web portal. Interested TS students can also apply through online mode at as per schedule.Students registration under corporate college scheme opening from 04-05-2018 to 28-05-2018. AP Free Corporate College Inter Admissions Online Application form Apply at epass.apcfss.in. 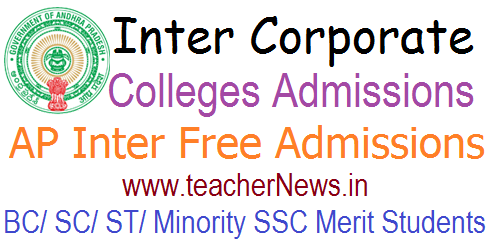 Free Intermediate Edn in Corporate Colleges for BC/SC/ST/Min 10th Class Students, AP Free Corporate Intermediate Online Application, notification scheduled released and Selection list, Merit list Download now. Application is not opening..!! Kindly update the exact starting date of apply. How can i open the link of selected list of AP corporate colleges inter free admission selected list 2018.